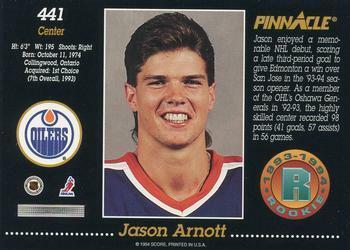 Jason Arnott was everything you could want in a hockey player. He was big, tough and talented. Arnott was certainly everything the Edmonton Oilers wanted when they happily snapped him up seventh overall from the Oshawa Generals in the 1993 Entry Draft and then watched him establish a franchise record for goals by a rookie with 33 during 1993-94 season. The end for Arnott as an Oiler came after just five seasons and 286 games when, to hear GM Glen Sather tell it, the pressure of playing in Edmonton and the off-ice distractions that became the focus of local media became too much. Sather maintained he never wanted to trade the kid, but, you know, the relentless negative attention left him little choice. “He got into a (paternity) problem but only one time,” Sather told the Edmonton Journal. “He was young. It became such a sensational scoop for everybody and it chased him out of town. He was sensitive, but what kid his age isn’t? I never wanted to get rid of him.” While there’s a kernel of truth in Sather’s take, that far from the whole story. Yes, Arnott was guilty of handling the trappings of wealth and youth badly. He enjoyed zipping around town in the flashy, new Viper he bought with his first contract. He partied. Then, the paternity suit. Arnott wasn’t the first Oiler, nor the last, to make mistakes. Players from the Stanley Cup teams did the same. The difference was that by the time Arnott arrived, the Oilers were clearly a team in decline. Success mitigates miss-steps, while failure tends to amplify them. Arnott’s Oilers had Shayne Corson as captain. Full stop. Sather could have stuck with Arnott but the bottom line is he chose not to, instead dealing him to New Jersey with Bryan Muir in January of 1998 for Valeri Zelepukin and Bill Guerin. Arnott was just 24 when Sather pulled the trigger on that deal. While Guerin certainly was a nice return, at least for the short term, the Oilers never got the consistent, quality years a grown-up and more mature Arnott had to offer in New Jersey, Dallas and Nashville. Gone too soon was Arnott, who, off-ice distractions and all while playing on bad teams, managed to score 100 goals and 239 points in his 286 games as an Oiler. Arnott would go on to score 317 more regular season goals in his other NHL stops and finish with 938 points in a career highlighted by his overtime winner to give the Devils the 2000 Stanley Cup. How many times in the years following Arnott’s departure have Oiler fans lamented the lack of having a big, tough, skilled forward like him? I’ve lost count. Arnott was all that, but it wasn’t to be – even though, in hindsight, it could have, and probably should have, been. I’m just glad the Oilers and Edmonton’s media learned their lesson with Arnott by not putting too much pressure on their young stars and then running them out of town when they didn’t live up to impossible expectations. Martin Brodeur won that year, Forsberg was the next year. Thanks I could not remember. His Stanley Cup winning OT goal for New Jersey was like a dagger to my heart. Do any of the current Oilers have sweet rides? I think I saw Ebs in a Yellow Volkswagen Beetle, but could have been a look alike. On a side I’d hoped I’d never have to read an Oilers story with Shayne Corson mentioned, those were dark days, darker than the 10 year run into the abyss. Something tells me that the old cagey veteran Corson knew how to bury a paternity suit. Always a benchmark – milestone for every Oiler and fan and/or supporter of the one that slipped through our system whatever that was or may be. Always liked Arnott as a player. The way so many good players in the post-dynasty era were chased out of town, and the dumb reasons for it, still irks me.